It's an event for us anyway! Four of us from Australia are about to embark in a few weeks time on a 5 week singles riding trip in the UK, Italy and France. 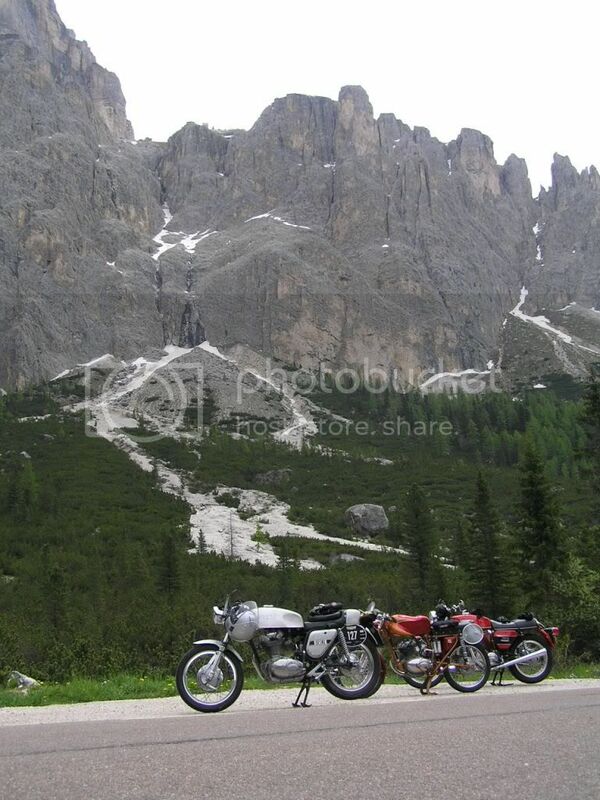 We'll have a week in the UK for two of us who have our bikes there, followed by a week in the Dolomites of Italy, then a week in north western Italy, and then a week in the French Alps. Partners have been placated (or bought off - that was expensive) and steeds have been fettled and are as ready as they will ever be. The line up is a 350 Silver Shotgun, a 175 SS, a 450 Mark 3 and 350 Mark 3. 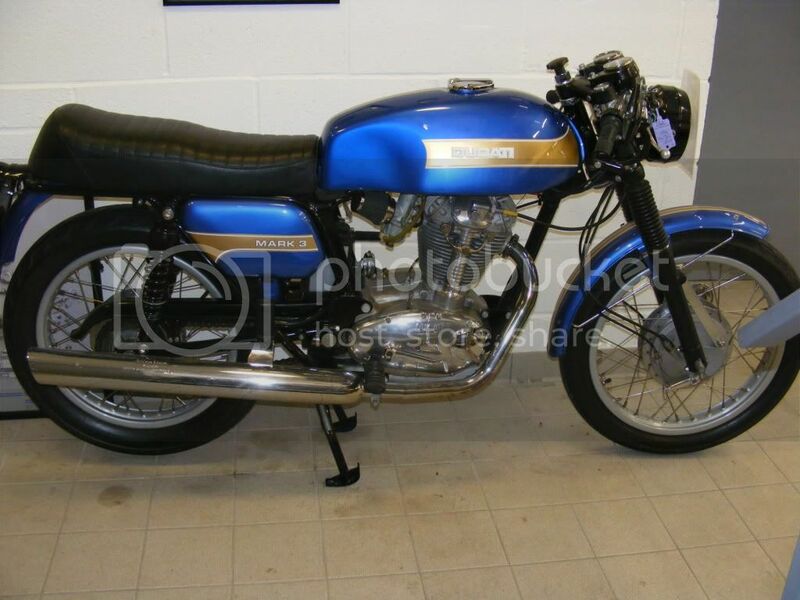 There is a 750 GT as a spare bike if need be. Here's hoping the weather will be kind. I'll try to post some pics from over there. One of the guys has a helmet mounted video. I'm hoping we can get some footage of the singles overtaking some modern kit in the mountain switchbacks! Last edited by machten on Mon May 21, 2012 12:40 pm, edited 2 times in total. Re: It's an event for us anyway! Would one of your fellow travellers be a gent named Graham E ? And the others from NSW? No Grahams on board and the four of us are from Western Australia. Some fun in the Dolomites. What a fantistic place to ride singles. 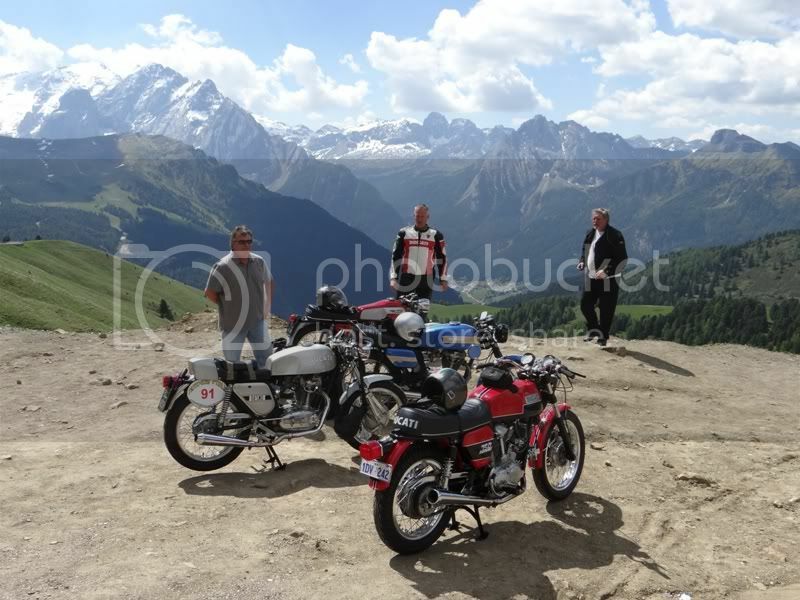 Some pics from the top of a few mountain passes around 2000 meters. We've done about 8 passes so far and about 200km per day. Rest day tomrrow for us, thankfully!! Not too far from my family. You guys eat rabbit and polenta there yet? Must have atop of Monte Baldo on the eastern shore of Garda. Enjoy and please add as many pics as possible !!! Ciao! You guys eat rabbit and polenta there yet? Yes and Yes! Not to mention pork. 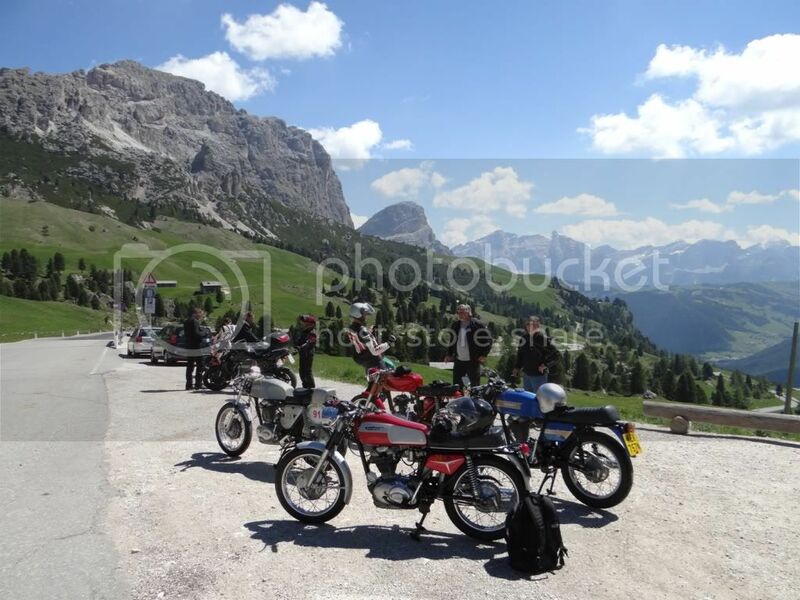 The photos above are taken in the South Tyrol region around the Bolzano area. The first one is atop Passo Sella between Sella Towers and the Grohmannsptize and i think the second is in Gardena pass, not too far from Sella. They all blur after a while! I'll post some more photos in the right area when I get a chance. We've had one day off riding in the last 2 weeks as the weather has been very kind. We're leaving the village of Graglia near Biella in North Western Italy today for the French Alps after some beautiful lake rides and a few more mountains. This looks like an amazing trip! Very jealous guys! These photos are killing me! I grew up in, continue to live in and will probably die in Illinois. It's flat as a pancake and there are no curves, only 90-degree intersections. Our motorcycle tires wear flat on the bottom while the sides retain the little nibs from when they were manufactured. I realize you guys have made your own good fortune by planning and preparing for this trip, and paid for it dearly too I am sure. I'm glad you guys are able to treat yourselves. On a trip that for many of us would be a once-in-a-lifetime adventure, it's great that you chose a batch of old Ducatis to make the ride on. Please post more photos if you can. Gotta love the scenery in those pictures. 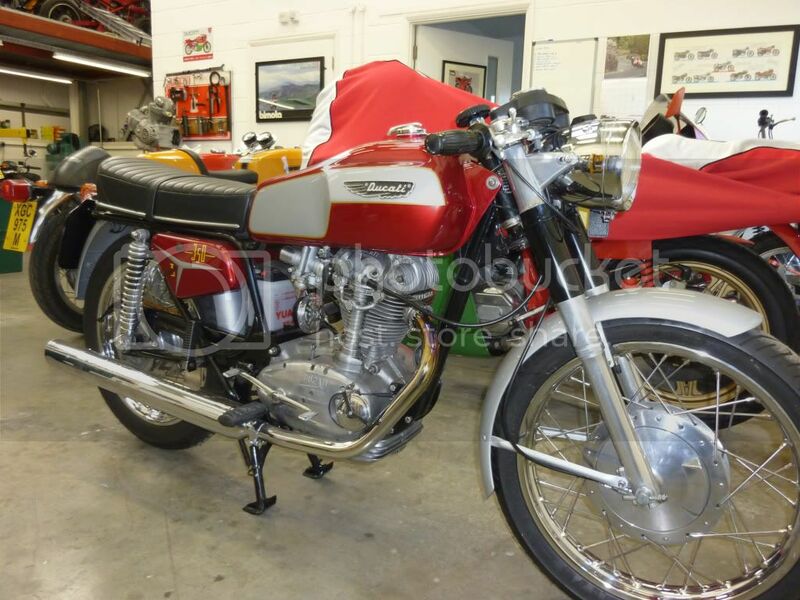 I love the fact that you guys are riding vintage Ducati's with clip on's as well, instead of some cushy Goldwing or Beemer. Have fun and post LOTS of pictures so we can follow along. I'm now in a more "wireless internet friendly" environment, and can upload some photos into the pictures area. One question before I do Jim...what is the favoured format for putting pictues in? I notice peoploe variously use thumbnails and pictures. What's the preference? 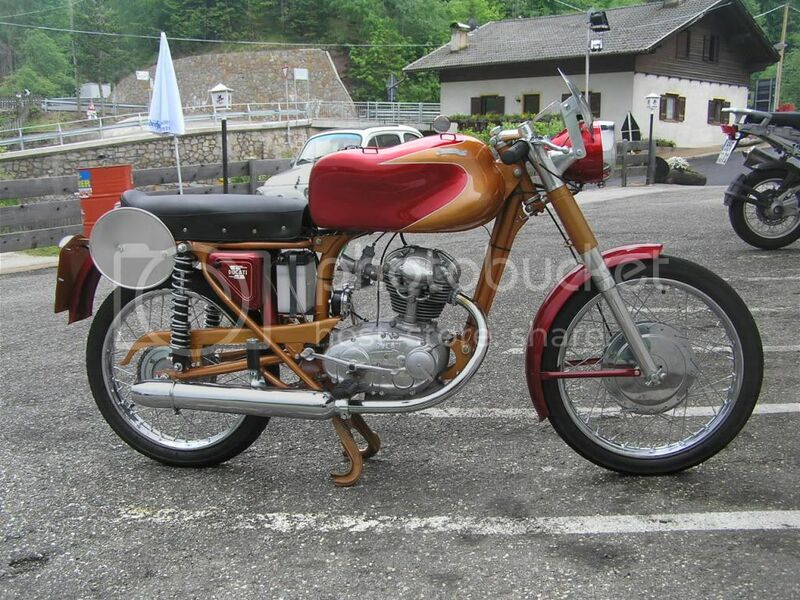 I love the fact that you guys are riding vintage Ducati's with clip on's as well, instead of some cushy Goldwing or Beemer. There's sure no shortage of those over here Mike! They are everywhere. But they are no match for a nimble single downhill and the cruisers are no match up hill either, even on the 175 SS. They are all very good about it, and the little Dukes sometimes even receive an ovation at the top the Cols and Passos as we ride in. Regarding the clip-ons, one of the wonderful things about internet forums such as this is that we arranged to meet up with "Craig from France" from this forum and his lovely better half in the French Alps with his 450 Scrambler and those high bars were looking pretty attractive later in the day - plus he was giving nothing away in the sweepers and switchbacks!